316L Surgical Stainless Steel make sure that there is no allergic reaction and infection. all the lip ring packed together gaue is 16G,normal size for your lips and nose.CZ differs from 3mm to 4mm.there are three bar size 6mm,8mm,10mm.you can wear it due to your lips condition. Choose your color as you like: silver tone,golden tone,rose gold tone. it can be used on your lips and nose,but please make sure that they can be connected in case of falling off. 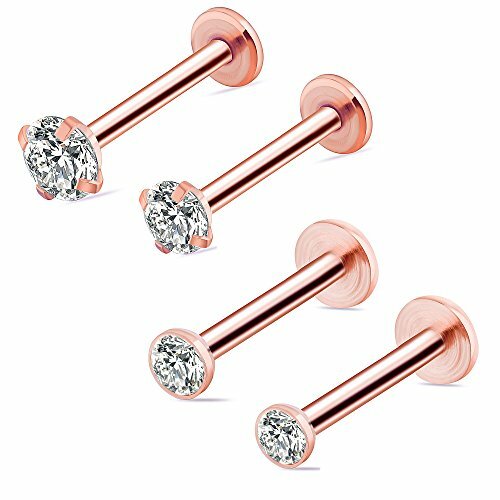 [Lip Ring]Material: made of 316L Surgical Steel and 3A zircon.No allergic reaction and infection. [Piercing Nose Ring]Color: Rose gold. If you have any questions about this product by Valloey, contact us by completing and submitting the form below. If you are looking for a specif part number, please include it with your message.